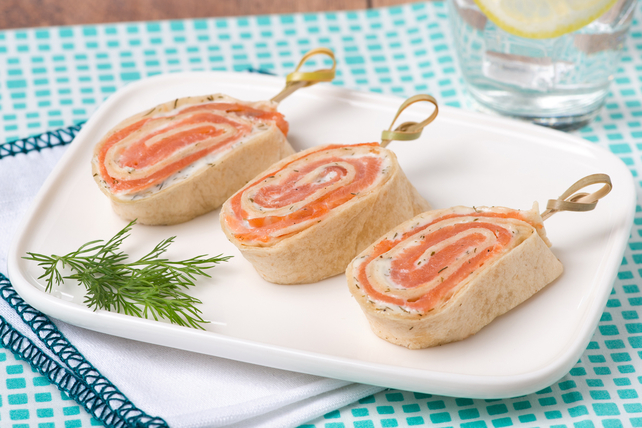 Try this tasty solution for an easy-to-make, yet elegant, appetizer. Spread tortillas with dip; top with salmon. Roll up tightly. Trim and discard ends. Cut each roll-up into 9 pinwheels. Prepare roll-ups as directed, except do not cut into pinwheels. Wrap roll-ups individually in plastic wrap. Refrigerate up to 24 hours before cutting into pinwheels to serve. To serve as part of a brunch or lunch menu instead of as an appetizer, prepare roll-ups as directed, then cut in half. Serve with a mixed green salad drizzled with your favourite Renée's Dressing. Insert frilled toothpick into each pinwheel to secure and make them easy to serve.